Legumes of the genus Lessertia have recently been introduced to Australia in an attempt to increase the range of forage species available in Australian farming systems capable of dealing with a changing climate. This study assessed the diversity and the nodulation ability of a collection of Lessertia root nodule bacteria isolated from different agro-climatic areas of the Eastern and Western Capes of South Africa. The diversity and phylogeny of 43 strains was determined via the partial sequencing of the dnaK, 16srRNA and nodA genes. A glasshouse experiment was undertaken to evaluate symbiotic relationships between six Lessertia species and 17 rhizobia strains. The dnaK and 16S rRNA genes of the majority of the strains clustered with the genus Mesorhizobium. The position of the strains at the intra-genus level was incongruent between phylogenies with few exceptions. The nodA genes from Lessertia spp. formed a cluster on their own, separate from the previously known Mesorhizobium nodA sequences. Strains showed differences in their nodulation and nitrogen fixation patterns that could be correlated with nodA gene phylogeny. L. diffusa, L. herbacea and L. excisa nodulated with nearly all the strains examined while L. capitata, L. incana and L. pauciflora were more stringent. Root nodule bacteria from Lessertia spp. were identified mainly as Mesorhizobium spp. Their nodA genes were unique and correlated with the nodulation and nitrogen fixation patterns of the strains. There were marked differences in promiscuity within Lessertia spp. and within strains of root nodule bacteria. Responsible Editor: Euan K. James. 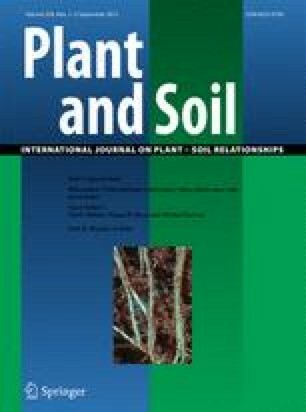 The authors would like to thank Mrs. Regina Carr (Centre for Rhizobium studies, Murdoch University) for technical assistance.